The representative said that hijacking theory was now ‘conclusive’, and police are now believed to be searching the home of pilot, Capt Zaharie Ahmad Shah. 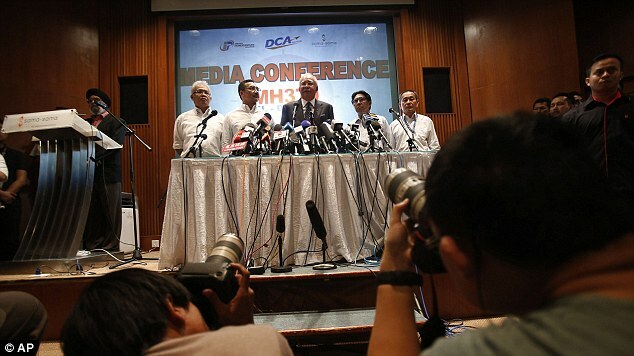 While Malaysian Prime Minister Najib Razak refused to confirm that flight MH370 was taken over, he admitted ‘deliberate action’ on board the plane resulted in it changing course and losing connection with ground crews. The plane’s communication system was switched off as it headed East over the Malaysian seaboard and its last known location was pinpointed six-and-a-half hours later than first thought. Re-routed: Malaysian officials have said radar data suggests the plane may have turned back and crossed over the Malaysian peninsula toward the Andaman Islands after setting out on a northeastern path toward the Chinese capital. 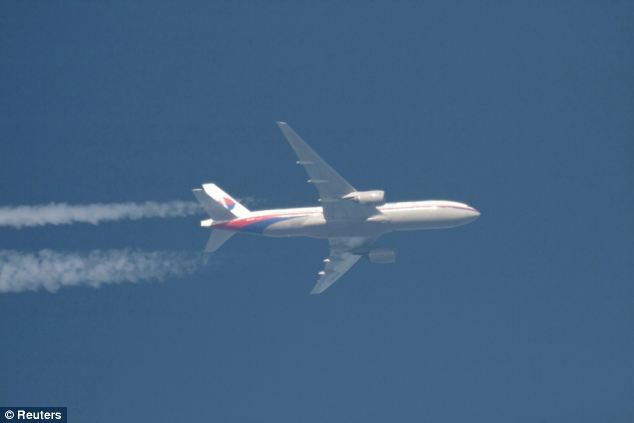 It is not yet clear where the plane was taken, however Mr Razak said the most recent satellite data suggests the plane could have headed to one of two possible flight corridors. One possibility is the northern corridor, which stretches from the border of Kazakhstan and Turkmenistan to northern Thailand, while the other is the southern corridor from Indonesia to the Southern Indian Ocean. 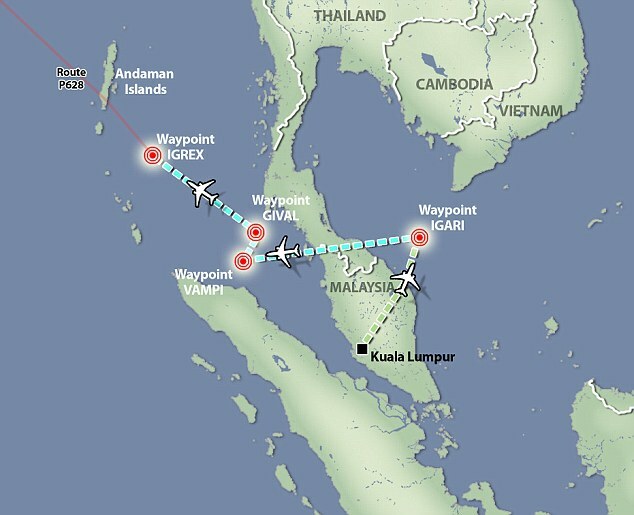 The last radar contact was made along one of these paths, but the plane could have diverted from this point. The aircraft’s fuel reserves mean it could have travelled as far as Pakistan, Sri Lanka or Australia in the other direction. However, if it was diverted into the Indian Ocean, the task of the search teams becomes more difficult, as there are hundreds of uninhabited islands and the water reaches depths of around 23,000ft. 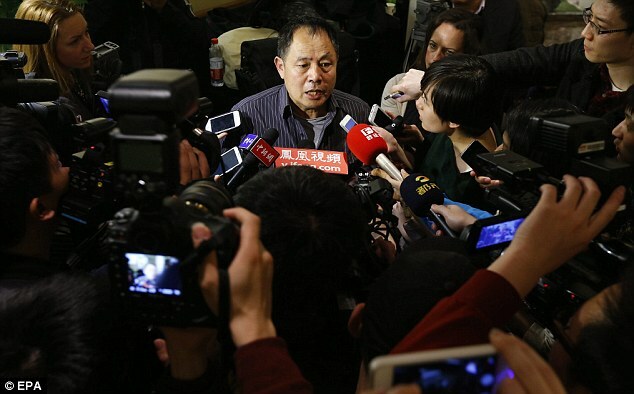 US investigators have also not ruled out the possibility that the passengers are being held at an unknown location and suggest that faint ‘pings’ were being transmitted for several hours after the flight lost contact with the ground. Malaysian authorities and others are urgently investigating the two pilots and 10 crew members, along with the 227 passengers on board. 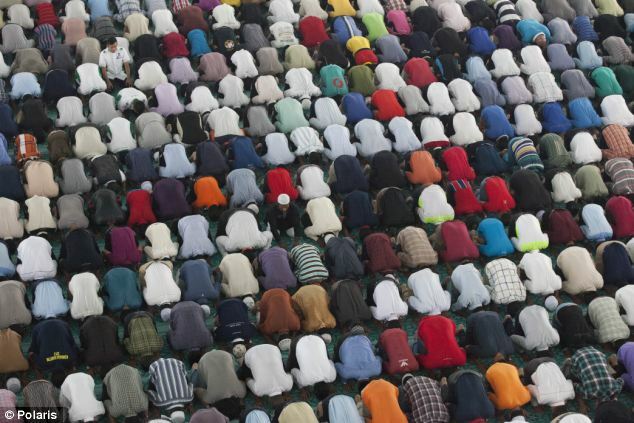 Police have already said they are looking into the psychological background of the pilots, Ahmad Shah, 53, and Fariq Abdul Hamid, 27, their family life and connections. The Boeing 777’s communication with the ground was severed just under one hour into the flight on March 8 from Kuala Lumpur to Beijing. It has now been confirmed the plane turned back and crossed over the Malaysian peninsula after setting out on a northeastern path toward the Chinese capital. Experts say signals from the plane shows it then continued flying for at least five hours in an unknown direction. The plane’s messaging system and transponder were both deliberately cut off and with them all hopes of further tracking the plane. American officials had been briefing Friday that the investigation was looking at ‘human intervention’ – one source even said it may have been ‘an act of piracy’. The disabling of the Boeing 777’s transponder and messaging system occurred around 12 minutes apart. Such a gap would be unlikely in the case of an in-flight catastrophe and gave authorities the clearest indication to date someone on-board was behind it. The motive of the hijack is still not clear. 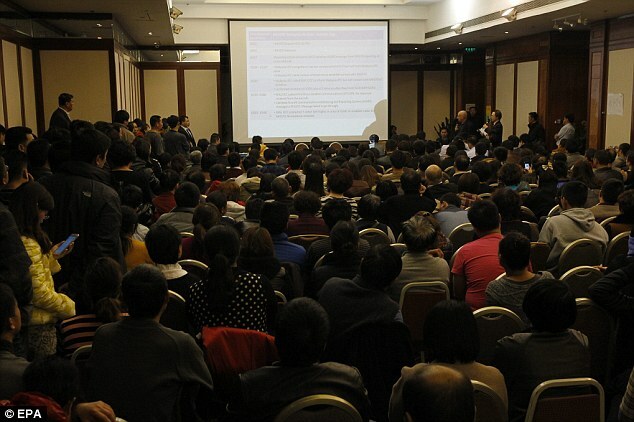 No demands have been made and no groups have publicly claimed involvement in the disappearance. Gone: The Malaysian Airways jet (not pictured) vanished on March 8 after communication was severed just one hour into a flight from Kuala Lumpur to Beijing. 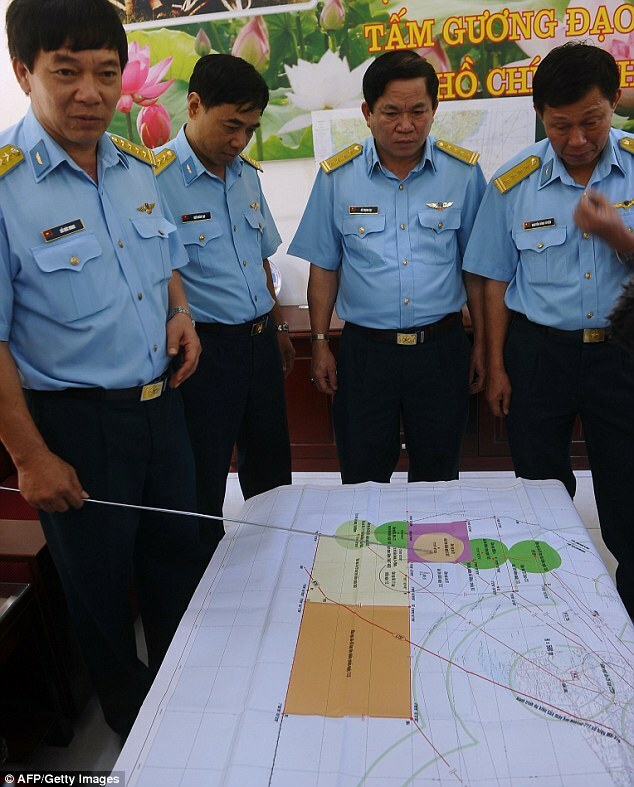 Search effort: Colonel Do Duc Minh (far left) Vietnam Air Force’s 370 Division’s Chief of Staff, points at a map as he speaks to reporters about search flights aimed at finding the missing Malaysia Airlines plane. Some experts have said that pilot suicide may be the most likely explanation for the disappearance, as was suspected in a SilkAir crash during a flight from Singapore to Jakarta in 1997 and an EgyptAir flight in 1999. The already global search effort will now be expanded along the two large corridors outlined in his speech. It is unclear how resources will be allocated but the Prime Minister said all the countries within those areas had been notified of the renewed focus. 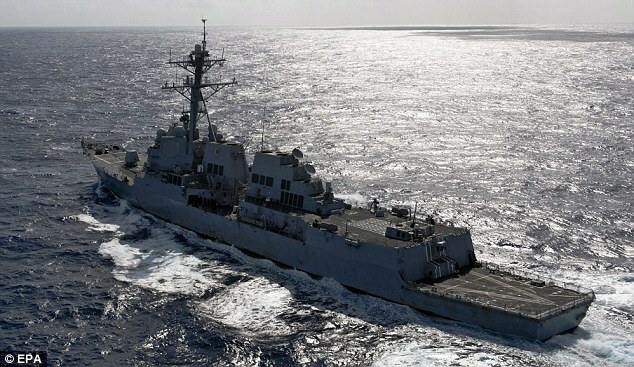 The USS Kidd arrived in the Strait of Malacca late Friday afternoon. It uses a using a ‘creeping-line’ search method of following a pattern of equally spaced parallel lines in an effort to completely cover the area. A P-8A Poseidon, the most advanced long range anti-submarine and anti-surface warfare aircraft in the world, will arrive Saturday. It has a nine-member crew and has advanced surveillance and reconnaissance capabilities, the department of defense said in a statement. 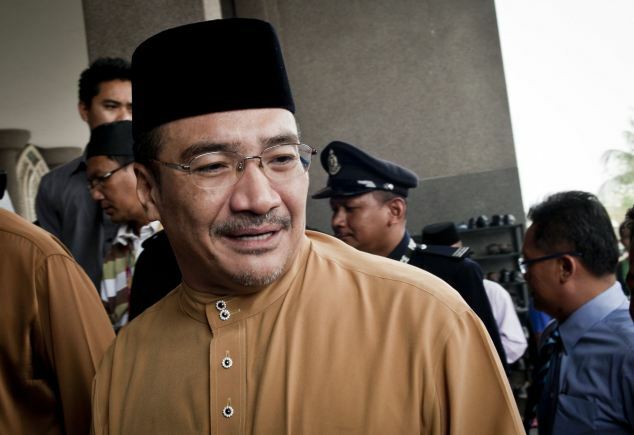 Malaysia has come under fire for what has been described as a ‘pretty chaotic’ search, with China saying the overall search effort has consequently been mired in confusion after a series of false alarms, rumors and contradictory statements. 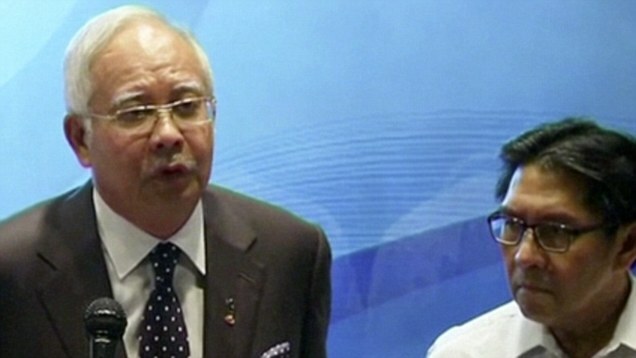 Meanwhile, the hijacking news will renew focus on the two pilots at the helm of the missing Malaysia Airlines passenger jet. 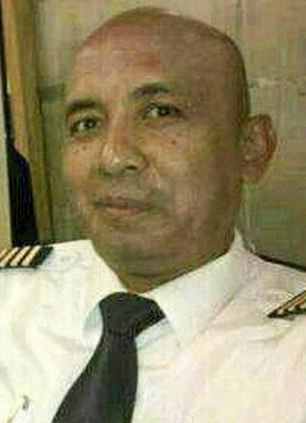 Despite the investigation, Malaysian officials and friends of the pilots have told MailOnline this week that there are no reasons to suspect either the Captain or co-pilot of having personal problems that would have resulted in them taking control of the aircraft. 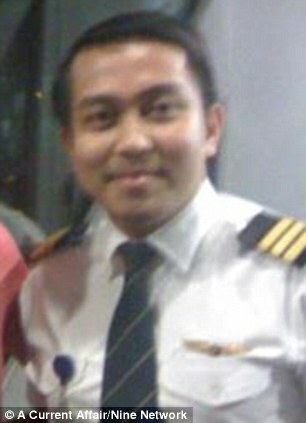 The only known blot on co-pilot Fariq’s character appears to be the time 2011 when he invited two South African women into the cockpit when he and another officer flew a jet from Thailand to Malaysia. In the days since the flight went missing, it has emerged that Shah was so passionate about flying he has is own flight simulator at home. As the search continued for the missing Boeing 777, military radar suggested the plane was deliberately flown towards India’s Andaman Islands. 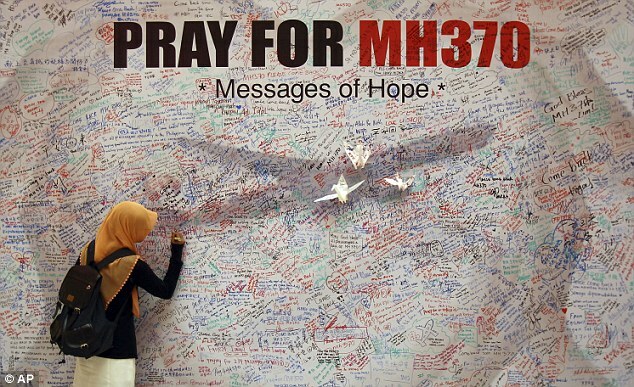 Two sources familiar with the investigation said an unidentified aircraft – which investigators believe was flight MH370 – was plotted by military radar following a route between navigational waypoints. 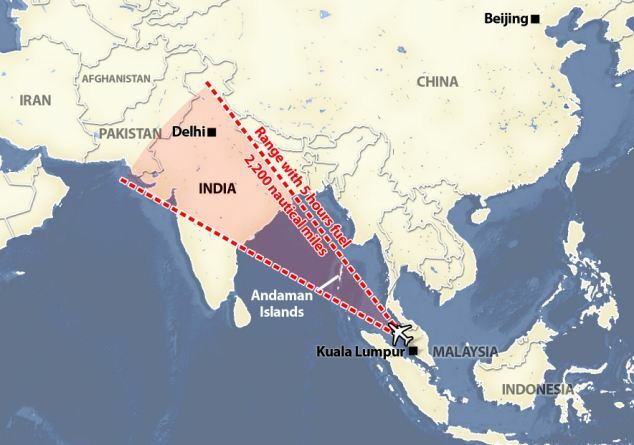 The last plot on the military radar’s tracking suggested the plane was flying towards India’s Andaman Islands, a chain of isles between the Andaman Sea and the Bay of Bengal, they said. India recently began searching hundreds of uninhabited islands in the Andaman Sea, using heat-seeking devices. The archipelago that stretches south of Myanmar contains 572 islands covering an area of 720 by 52 kilometers. Only 37 are inhabited, with the rest covered in dense forests. The focus of search efforts shifted on Thursday from the South China Sea after the US said ‘new information’ indicated that Malaysia Airlines Flight MH370 may have gone down to the west in the Indian Ocean. China, which had more than 150 citizens on board the missing plane, has deployed four warships, four coastguard vessels, eight aircraft and trained 10 satellites on a wide search area. Chinese media have described the ship deployment as the largest Chinese rescue fleet ever assembled. Its only previous fatal crash came on July 6 last year when Asiana Airlines Flight 214 struck a sea wall with its undercarriage on landing in San Francisco. 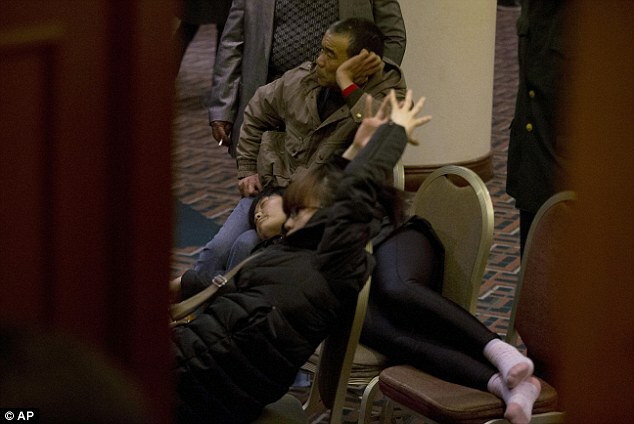 Three people died in the incident. 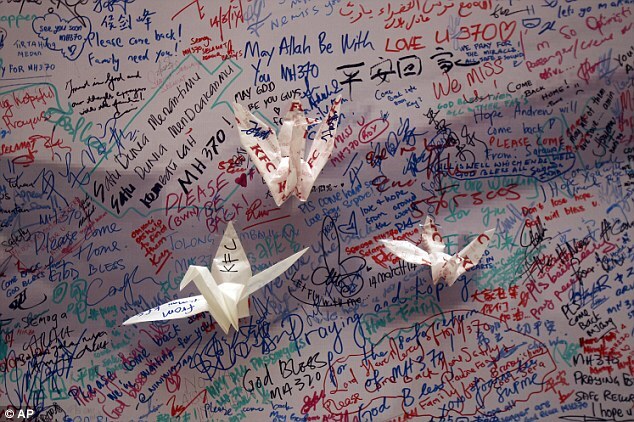 The missing Malaysia Airlines Boeing 777-200 sent signals to a satellite for four hours after the aircraft went missing, an indication that it was still flying for hundreds of miles or more, according to a U.S. official briefed on the search for the jet. 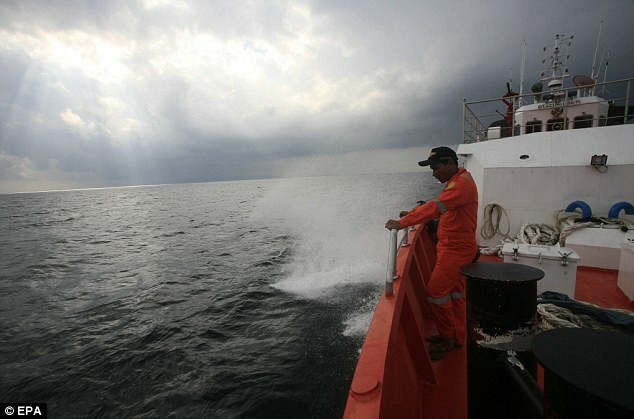 This raises the possibility that the plane may have flown far from the current search areas. Transponders are electronic devices that automatically identify commercial aircraft within air traffic control radar range and transmit information on the plane’s identity, location and altitude to ground radar stations. Beyond radar range, they enable planes to be identified and tracked anywhere in the world by satellite. Transponders can be turned off by pilots. 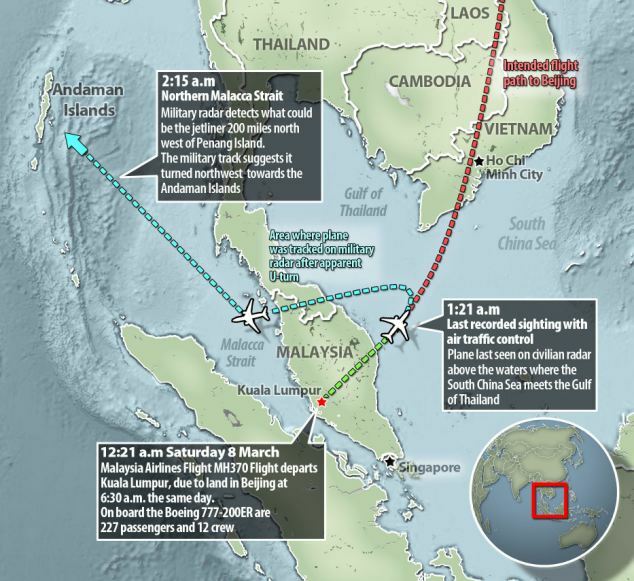 The missing jet’s transponder last communicated with Malaysian civilian radar about an hour after takeoff, when the plane was above the Gulf of Thailand between Malaysia and southern Vietnam. ACARS – or Aircraft Communications Addressing and Reporting System – is a data link system used to transmit short messages such as weather updates and status reports between aircraft and ground stations via radio or satellite. According to the U.S. official, ACARS messages sent by the missing plane continued after its transponder went silent, although he wasn’t certain for how long. Boeing offers a satellite service that can receive data during a flight on how the aircraft is functioning and relay the information to the plane’s home base. The idea is to provide information before the plane lands on whether maintenance work or repairs are needed. Even if an airline does not subscribe to the service, planes still periodically send automated signals – or pings – to the satellite seeking to establish contact. Malaysia Airlines did not subscribe to the satellite service. The U.S. official said automated pings were received from the jetliner for four hours after it went missing, indicating it probably flew for hundreds of miles beyond its last confirmed sighting on radar.